Hemel Town were left to rue yet another controversial refereeing display as they were pegged back from 2-0 up to draw 2-2 at Dartford. Dean Brennan’s side were forced to play the majority of the second half with 10 men after Ed Oshodi was shown a harsh red card, and Dartford took advantage to bag an injury time equaliser. “It felt like a defeat for the players because, if I’m being honest, we were totally dominant,” said Brennan. “In the first 10 minutes they had a decent chance, but after that I thought we took control of the game and I thought we were excellent. We were outstanding right throughout the game, even with 10 men. 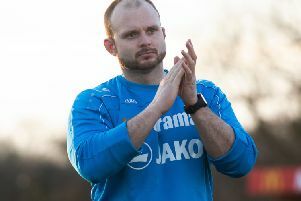 Speaking about the game-changing moment, the Hemel boss continued: “We’ve just been on the wrong end of refereeing decisions in recent weeks which have really cost us to be honest. We will be appealing Oshodi’s red card because I’ve looked back at it and it isn’t even a foul. I can’t believe he’s been sent off to be honest. Hemel could also have ben awarded a penalty for an apparent shove on Oliver Hawkins, but again the decision went against them. “In my eyes we should have had a stonewall penalty for a foul on Hawkins, but it’s down to the referee it give it,” said Brennan. “Those are two big incidents and decisions which have gone against us. “What I like about rugby is that nine times out of 10 referees get the decision right, and when they do get it wrong, they admit it. When referees get decisions wrong in our games, nothing is said about it, but the managers get bans. “It’s frustrating because I just don’t think it is transparent enough.